Marathoner, Winner of Melbourne Marathon 2006, New Orleans & Denver Marathons 2010. I first started running with Steph in 2007. During our training runs Steph would give me advice on how to make better food choices to help limit the amount of toilet stops I would need to make during training (mostly “Kaz please stop eating date bars and yoghurt before running!”) That was when I first learned about the influence of fructose, lactose and FODMAPS in different foods. Steph is extremely knowledgeable about sports and specifically gut nutrition and is an excellent motivator. Steph gives me the most up to date information on how to maximize my nutrition for training and racing and provides me with detailed nutrition strategies and guidelines. I would highly recommend working with Steph if you want to improve your nutrition and achieve your sporting goals. 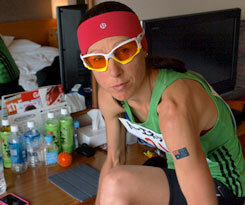 I am looking forward to racing the Nagano Marathon in Japan in 5 weeks time and hopefully running a PB. I know that with Steph’s help I will have the nutrition aspect nailed. Now all I have to do is avoid those date bars, train smart and recover well!